ON SALE: use coupon code SUMMERLOVIN for 20% off now through Saturday. 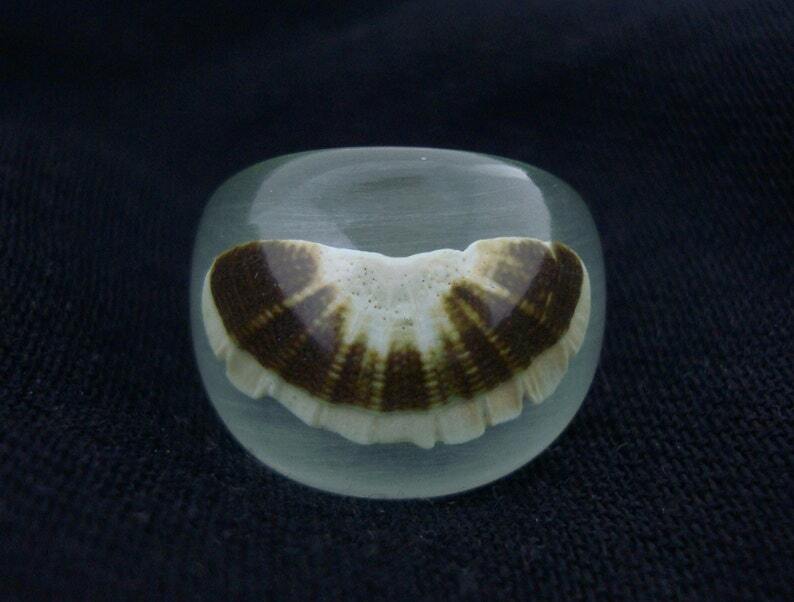 This is a clear pale blue dome ring containing a segment of a Chiton from the Puget Sound. This is no mere plastic jewelry! The material used to cast this piece is UV stable with a high heat tolerance (won't yellow in the sun, and it won't soften with body heat). Because it is industrial grade urethane, it is scratch-resistant and practically shatterproof. Fluorescent Green and Cobalt Blue big disk earrings. Encore de magnifiques bagues, de la bonne taille. Je suis ravie. Je conseille vivement cette boutique, merci beaucoup. Very reliable seller, responsive and involved. The ring as it turned out has a double life when exposed to sun. Thank you Dave! There are many payment options now available for you to make your purchase. Once payment is received, I'll get your item in the mail. Thanks. Typically I will wait about two days after an order has been placed (and paid for) before shipping an item. I've had a surprising amount of sales that were either made mistakenly, or minds were changed after I'd shipped the item and there's really a lot of leg work that I have to do on my end to make it all right with Etsy (reversal of fees, reversal of sale, etc.). Or stop by a jewelry shop and ask to have your finger sized. Flying Saucer Ring - It glows in the dark, of course.